In the course of our buying rough gem materials we often come across items which are too "cool" to be cut into finished gemstones. They may show really nice crystal faces or cool inclusions or be more interesting just left as nature intended. Many people want the organic look and feel of crystals in their raw form. If you have requests for certain items please contact us...we may well have it..but have not had the time to list it here. All prices are G.S.T. (Goods and Services Tax) exclusive...your G.S.T. (payable by New Zealand customers only) will show on final checkout. All prices are in New Zealand Dollars. 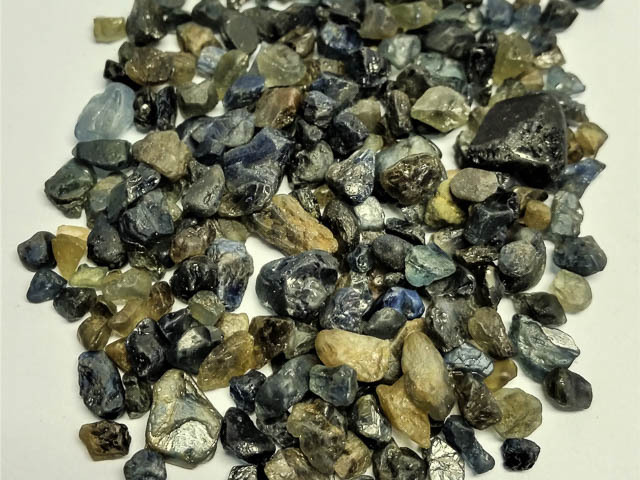 Australian natural and untreated Sapphire rough crystals. Each lot is 150 plus carats (30 grams) with approximately 200 pieces (could be less or more as per sizes). Slight differences from lot to lot but all similar to photo. Sizes from 4x3 mm to 10x8 mm approx. These are mostly translucent (but not transparent) . Translucent is defined as hold up to the light and light will pass through. Colours include blue, green, greeny blue, gold and yellow but most are blue( from dark to mid colour). Good for Specimen and Crystal use. These are direct from miner from the Central Queensland Sapphire fields. 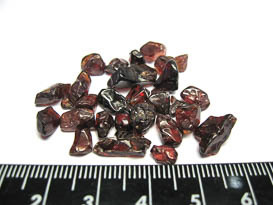 5 large Almandine Garnet crystals. 150 grams plus and slight variation in the crystals sizes with one smaller, two medium and two large. From Mozambique and they have been polished on the natural surfaces of the crystals. The colour is a dark brown. Interesting lot of Beryl crystals. These are what is known as floater crystals which means they are usually formed with no attachment points. Lots of lovely sparkly crystal surfaces..cool looking. Mix of sizes and colours as shown. 30 grams 15x8 to 25x8 mm approx. From Brazil and completely natural and untreated. 105 plus grams of doubly terminated Dravite Tourmaline from India. Dark gold to brown there are five pieces per lot and size range is from 20x15x20 mm up to 35x25x24 mm. . Most of the pieces are opaque but there will usually be some translucency and colour in the smaller pieces. Good crystal shape and faces but there are some abrasions on junctions between faces and some small chips here and there. Golden Topaz specimen lot of 100 carats plus. Dimensions are from 10x5 mm up to 20x10 mm approximately. Six pieces per lot and each lot is very similar. These specimens are a good golden colour and as per photos have some weathered surface areas and some chips and nibbles on the edges. They also have natural inclusions, cleavage planes and feathers internally. Nice lustre and good specimen pieces. These are natural and untreated and are from the town of Ouro Preto in Minas Gerais state in Brazil. Yellow Opal from Tanzania. This is a 100 gram lot that could also be cabbed or carved. This a variety of Opal Called common opal since it does not have the play of colour or fire that you see in Australian opal for example. Seven pieces per lot and sizes vary from approximately 25x20x10 mm to 50x35x20 mm. Items are shown wet in photos. Not all will be suitable for cutting since there are natural cavities and fractures here and there. Price reflects the grade. Malachite and Chrysocolla. 200 grams. From Katanga province in the Congo which is the main source for Malachite. Nicely polished and has blue Chrysocolla layered in with the green Malachite. Has some very cool looking patterns and orbs. Be aware that this is really a display specimen and we do not suggest cutting and or lapidary working it since the material forms in layers of differing hardness. This might create crumbling or flaking if cut. Measures 90x55x40 mm. Sunstone Feldspar from state of Oregon in USA. Lots are 16 plus grams or 80 carats plus and are a yellow to champagne colour. Mostly transparent these are also cuttable. Size varies from 10x5x4 mm to 16x10x5 and approx 19-22 pieces. High quality mixed colour Tourmaline crystal lot from Nigeria. 10 gram or 50 carats per lot and all lots same high grade. Mix of blue-green, green, green blue, gold and pink and all shades. Transparent and sizes from 4x3 to 8x5 mm. Rhodolite garnet crystal lot that has been tumbled so nice and sparkly and bright. 50 carats plus per lot and approximately 25 pieces. From 3mm up to 10mm but most are around 5mm. Good pinky red colour and most are transparent. Red Garnet crystal lot from Tanzania. 10 grams or 50 carats plus. 20 pieces plus minus and sizes range from 3mm up to 10mm. Nice red colour and good sparkle and most are transparent. 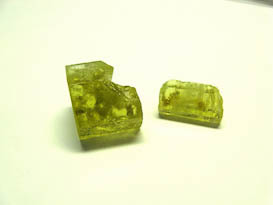 Doubly terminated Dravite tourmaline crystal. These are dark brown to golden in colour and average in size to 24x15x15 mm. Some facet junction abrasions and a few small dings but good specimens. Nice lot of Baltic Amber. 10 grams of natural pieces cleaned but not polished. Size is from 10 to 14 mm plus minus and number of pieces ranges from 32 to 38. Some opaque and some transparent as shown This is a lovely specimen of Sapphire. 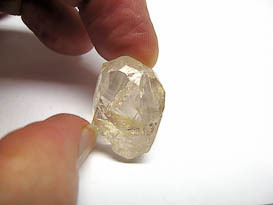 From Ratanapura in Sri Lanka 22x10x7mm and weighs 15.90 carats. Good transparency but is alluvial or river tumbled so has a soft matte surface. Shows the text book by-primidal crystal strructure. Nice lot of Spessartite Garnet crystals. 20cts plus and 21 pieces with sizes from 4mm to 6mm. These are facet grade mostly free of inclusions and have a nice orange colour and most still have original crystal shape and faces. Ruby crystal from Mysore state in India. These large crystals difficult to obtain now. 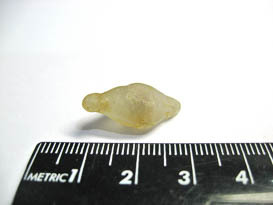 This specimen weighs100.52 grams and measures 55x25x22 mm. Nice example of Ruby crystal habit. 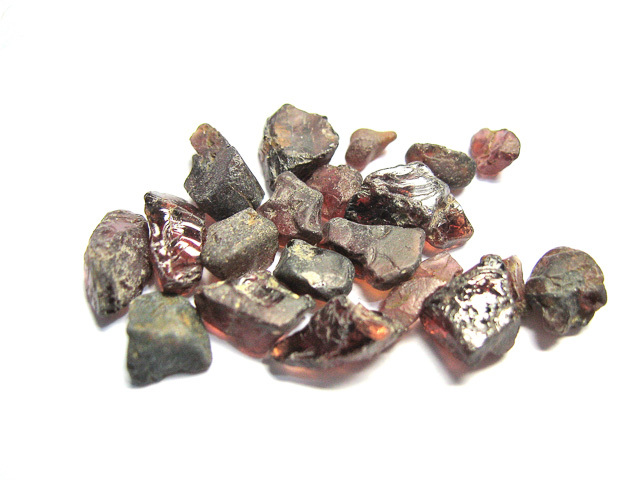 Very nice lot of Spessartite Garnet crystals. 10cts plus and 11 pieces with sizes from 4mm to 6mm. These are facet grade mostly free of inclusions and have a nice orange colour and most still have original crystal shape and faces. Ruby crystal from Mysore state in India. These large crystals difficult to obtain now. This specimen weighs 83.7 grams and measures 53 x20x20 mm. Nice example of Ruby crystal habit. Garnet 10 gram crystal lot from Tanzania with good browny/red and pinky/ red colours as shown. Size is mostly small varies from 5 mm to 9x7 mm on average. Good transparency. Good for Specimen and Crystal use as well. From Lava Plains Sapphire field in Queensland. We have 11 pieces specimen grade Australian Sapphire. 71 cts plus in weight and size ranges from 5x6 mm to 12x10mm plus minus. Dark blue to black and opaque but lots of crystal faces. White rough unpolished Moonstone crystals from Tanzania. 50 gram per lot and approx 30 plus pieces per lot. Sizes vary from 10x6mm to 20x12mm. Large Amethyst crystal. This weighs 223 cts and measures 50x30x20 mm. It is a light medium colour and has a mix of natural crystal surface and fractures. Its transparent but has internal feathers and growth lines. Large Amethyst crystal. This weighs 206 cts and measures 45x30x20 mm. It is a light medium colour and has a mix of natural crystal surface and fractures. Its transparent but has internal feathers and growth lines. Large size Sapphire crystal Ratnapura in Sri Lanka. Beautiful specimen or as unusual piece of jewellery. 18.54 cts and 28mm by 10 by 8. Lots of natural inclusions but good translucency and terminations. Colour is blue grey. Garnet crystal lot from Tanzania. Dark red and transparent when you hold up to light..lovely red. Average number of pieces per lot is 16 @20 cts each. Quite shiny and reflective on surface. Small pieces average 5mm. 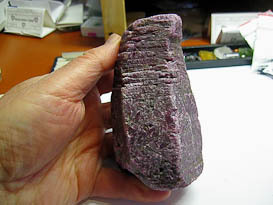 Large Ruby crystal specimen. Hard to obtain now. 200 grams from Karnataka mine in India. Measures 60 mm high by 30mm by 30 mm. Polished one side of hexagonal crystal to see what it looks like under the surface exterior. 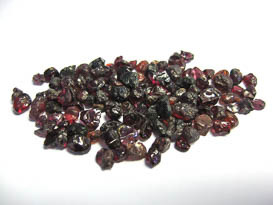 40 ct lots of specimen grade Garnet from Burundi. Dark red when you hold up to light. Small alluvial stones so reasonable polish. Average size is 2.5 to 3.5 mm. Specimen or crystal use of course. Good crystal and specimen lot of Demantoid Garnet rough. 32 plus carats in weight and 11 pieces. All have some crystal habit and most show some transparency. From 5 to 10mm in size. Each lot slightly different but similar. Three octahedral natural Spinel crystals from Sri lanka. For specimen and crystal collectors and are average size of 7x5mm. 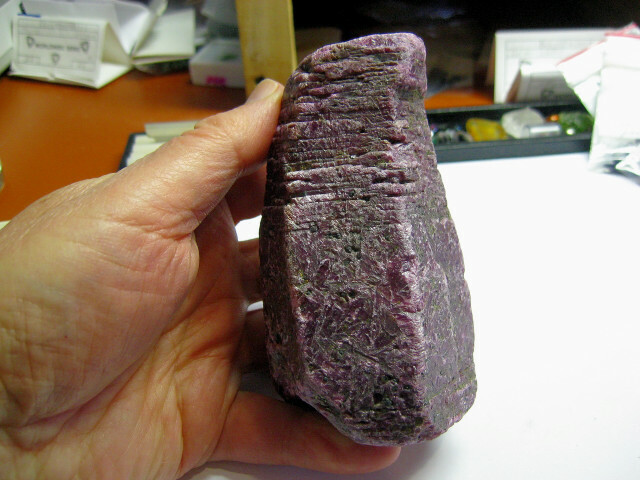 Colour is dark plum and these do show some weathering and natural distortion of crystal shape. 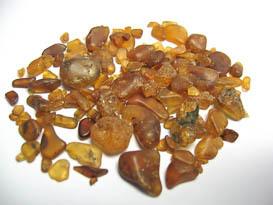 6 plus cts total Zircon crystal lot from Sri lanka. For specimens and most show crystal habit. These are brown and dark gold and are ranging from 10x5 to 20x6mm. 36 plus cts. Nicely polished tumbled Citrine lot. 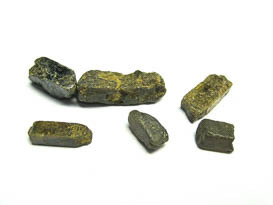 50 plus grams per lot as shown and size is from 6 or 7mm up to 15x10 mm. Light medium in colour and transparent but have natural feathers, inclusions and clouds internally. Alluvial Spessartite garnet rough specimen lot. There is approx 112 cts plus here and ranges from tiny to 10 to12mm. Orange to dark orange in colour and specimen grade. Very nice specimen from Gilgit in Pakistan. 188.13 cts and measures 40x25x28mm. Aquamarine crystal with intergrown mica flakes on a base matrix. Aqua measure 25x20 x20mm and is well shaped, transparent with good termination. 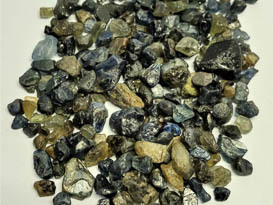 40 carats of Sapphire rough from Queensland Sapphire mines. You couldnt buy lunch for the workers at this price. Old stock and prehistoric prices. Specimen but some are cutttable ...but small. 3-5mm average and 120 plus crystals. 60 pus cts of Tourmaline crystals. Mixed colours from pink, blue, and light to dark green. For specimen use and collectors. From 4-5mm up to 15x10mm. 7 pieces of Hiddenite crystals from Pakistan. Lovely green colour and plenty of transparency. Last lot and selling out at cost to clear the deck.. 80.08 cts and pieces range in size from small of 12x6x4 mm to 15x13x12 mm. Aquamarine crystal lot for crystal or specimen use. 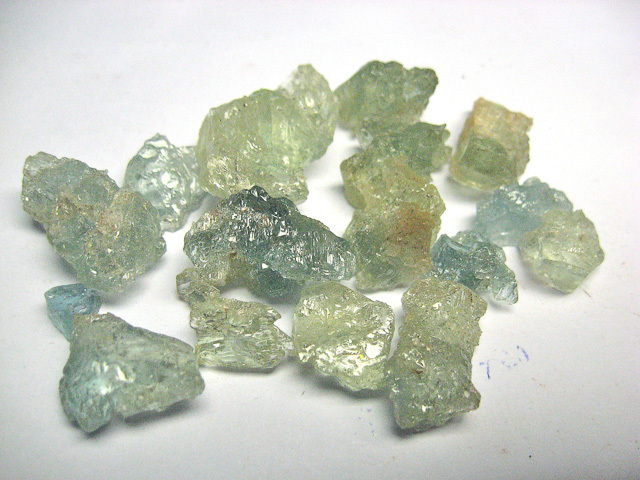 Greeny blue colour and lot weighs 100 carats or 20 grams. From Brazil and has good transparency but not cutting quality. 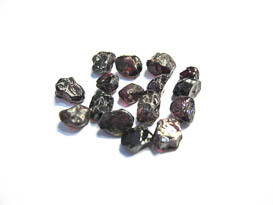 Approx 45 pieces and size is 4mm up to 12x5 mm Garnet rough crystals. Four pieces with total weight of 63 grams. All show crystal faces and shapes but are all worn on surface. Dark brown and no transparency. From Burundi. Average size is plus or minus 20mm. Garnet from Burundi. These are big crystals which have been polished following the natural crystal faces. They are dark brown and have no transparency but show crystal shape well. 150 cts plus (30 grams) 25x20 mm plus. 10 pieces of rough Sapphire crystals from Lava Plains Queensland. Just for specimen or crystal use. From7x5 to 20 x10 mmin size and some show some blue when held to light. 72 carats total This very large Ruby crystal show the crystal shape very well. It weighs 764 grams and is opaque. Pinkish red colour with a smattering of gold pyrites flecks on surface. Measures 105 mm high and 50x55 in diam at base. Sell at cost. Nicely shaped and terminated crystal from Pakistan. Is very light pink in colour and has good transparency but some natural feathers and inclusions. 18X18X11 mm and weighs 63.58 cts. Very nice specimen from the old Tsumeb mines in South West Africa (now Namibia). Collected many years ago and highly collectible now. Measures 40x30x25mm and has a multidude of small beautifully coloured and formed crystals 11.08 cts of Sri Lankan natural Sapphire crystals. 4 pieces as shown from 10x4 mm to 13.5 by 7. All show good crystal shape and are translucent to transparent. Multi Aqua crystal plate with some small mica leaves.� About 10cm by 8cm with height of 4cm.� The Aqua crystals are milky light greenish blue (non transparent.� Most have good termination and crystal shape.��� Sells for cost. Extremely nice Aquamarine floater crystal. Weighs 107.63 cts and measures 48 x25 x20mm. Could look at this for hours. Lovely etched crystaline faces all over this piece and has great lustre. 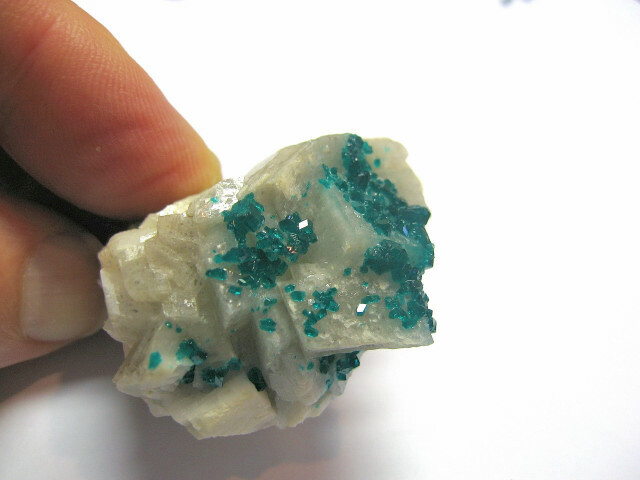 Large Dioptase specimen from Tsumeb mine in S.W. Africa. Mine has been closed for many years..this is why specimens are so sought after. 70mm long by 60mm wide by 45mm high. Top grade specimen. Lovely, lovely!! Two nicely shaped sections of crystal of Golden beryl 27 carats. These both show excellent colour and good hexagonal crystal shape. Transparent but with lots of natural inclusions. Smaller is 14 by 7.7mm. 40 plus pieces of Garnet Crystals from Gilgit in Pakistan. Weight is over 300cts and sizes range from 2 to 18cts approximately. Good value and all show some red translucency and have crystal faces and symmetry. Beautifully formed twinned Sapphire crystal from Ratnapura in Sri Lanka. Weighs 65.36 cts and one crystal is 28mm high and other is 23mm. White with translucent interior and well terminated. 2 rough garnet crystals and one that has been polished. Nice for specimens and to show crystal symmetry and growth. Good size at approximately 22mm in diameter for larger.